The paperback version of the book is due out May 16 but today might be your lucky day because will select TEN lucky winners! To enter to win you must follow us on Twitter (@HipHopDX) and tweet “Hey @HipHopDX, I want to win a copy of @Ben_Westhoff’s “Original Gangstas” book! #DXOG.” Remember, you must be following us and you must tweet using the #DXOG hashtag in your tweet. Original Gangstas is the product of five years of reporting and more than 100 interviews — rappers, producers, girlfriends, music industry experts, gang members — not to mention countless hours digging through court files and examining microfiche. The book has received great reviews, including from Kirkus (“An elaborately detailed, darkly surprising, definitive history of the L.A. gangsta rap era,” starred review), NY Daily News (“stunning and entertaining”), Booklist(“especially relevant amid the ongoing Black Lives Matter movement”) best-selling author Shea Serrano (“airtight and unflinching”), and even Chuck D from Public Enemy (“shows how the rap West was won”). It’s full of never-told revelations, about Dr. Dre’s abusive past, Tupac and Biggie’s friendship-turned-deadly-rivalry, Ice Cube’s relationship with the Nation of Islam, and the last weeks of Eazy-E’s life, when he contracted AIDS and married his girlfriend on his deathbed, willing her his $30 million record label. 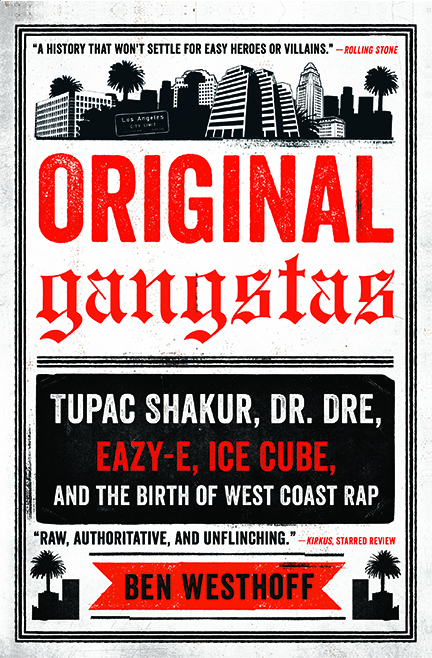 Share the post "Book Giveaway: The Untold Story Of Dr. Dre, Eazy-E, Ice Cube, Tupac Shakur & The Birth Of West Coast Rap"